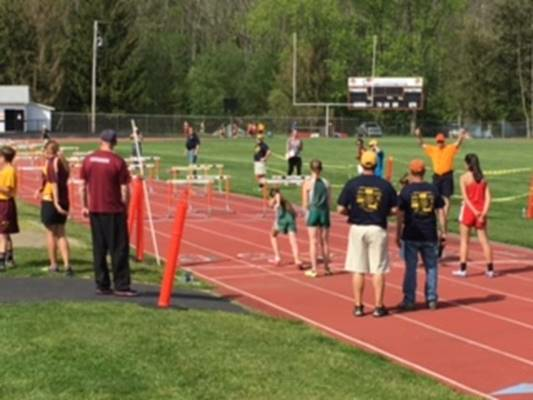 On May 20th, the Tunkhannock Rotary Club hosted the 32nd Annual Rotary Relays Invitational Junior High Track Meet at Memorial Stadium in Tunkhannock. The historic Rotary Relays began in the 1980s, and returned in 2016 after a four-year hiatus due to junior high sports funding issues within the region. The event was attended by seven different teams from the Wyoming Valley Conference and Lackawanna League including Hazleton Area, Lackawanna Trail, Lake-Lehman, Susquehanna, Tunkhannock Area, Wyoming Area and Wyoming Valley West. Over 200 girls and boys competed in 14 different relay events including seven track relays (4x100/110 shuttle hurdles, 4x100, 4x200, 4x400, 4x Mid-Distance Medley, and 4x1600), three throwing relays (3x Shotput, 3x Discus, and 3x Javelin), three jumping competitions (3x Triple Jump, 3x Long Jump & 3x High Jump) and the 2x Pole Vault Relay. The event was electronically-timed by Wil-Time Event Management, who also does the official timing for several other PIAA and NCAA track & field meets throughout the region. The top three relay teams in each of the 14 events received individual medals, and six team trophies were handed out for the best school on the track, best field event school and individual team champions. Wyoming Area won the boys overall title, with Hazleton Area and Wyoming Valley West rounding out the top three. Hazleton Area won the girls title, with Wyoming Valley West and Wyoming Area taking second and third, respectively. Gate fees and donations were collected to benefit the Special Olympics and the Paralympics. The club thanks the generous sponsors who helped fund this event and the relay t-shirts. The Tunkhannock Rotary Club hopes to build upon the successful return of this track meet, and looks forward to an even more successful event in 2017.